After a particularly soul-squashing day at work, film buff Charlie has an epiphany and resolves to change his life by morphing into the real-life version of Al Pacino's most famous characters, resulting in a series of devastating and hilarious confrontations. 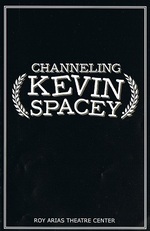 Channeling Kevin Spacey is a 2-man show where one guy performs 'the main character' and the other guy performs all the other roles (both men & women). The main character is sort of awkward until he decides he's going to be more like Al Pacino and starts turning into a tough guy. The premise sounded intriguing, and the show was mildly entertaining. It lasted about 90 minutes and it did have some parts that were quite funny. Unfortunately it also had a lot of scenes that were just plain weird and seemed to be targeted towards the 8-15 age range (which was odd, considering the average attendee age was closer to 45). There were a lot of references to kevin spacey/al pacino movies, so if you're a huge fan and willing to sit through the weirdness, you might enjoy the show. Agree with Chris. The show had some very (and I mean very) weird moments. Although the show is suppose to be goofy, it came off misogynistic and very forced. Overall, the story was unoriginal and just uncomfortable. Do NOT pay money to see this play.